The plaque commemorates those who served in the 2nd / 23rd Infantry Battalion during World War Two. 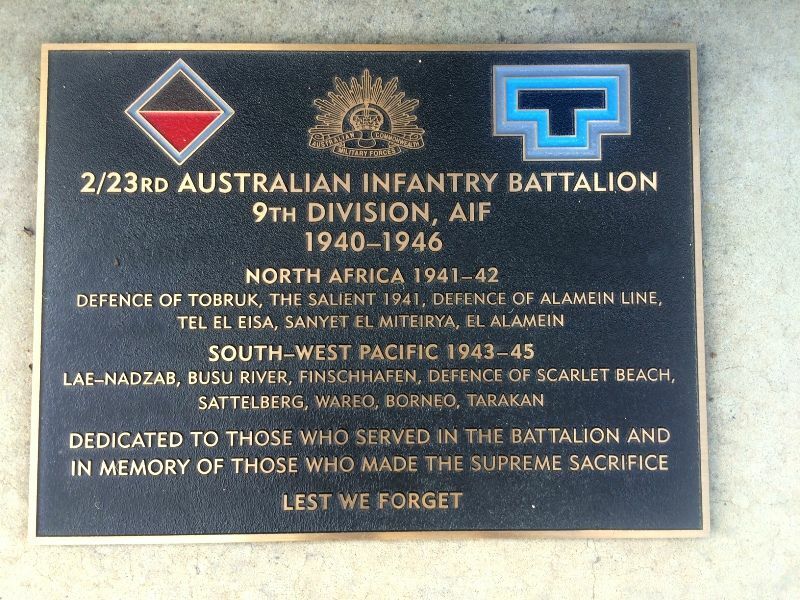 The Battalion was raised at the Albury Showgrounds in New South Wales in August 1940, as part of the 26th Brigade. The battalion did its initial training in Albury before moving to Bonegilla, Victoria, before sailing for the Middle East in November 1940. Initially the brigade belonged to the 7th Division but in early 1941 moved to the 9th Division. In 1941, The battalion helped defend Tobruk for eight months, manning a series of concrete pillboxes located in a semicircle around the town, called the Red Line. The battalion fought on fronts across Europe, Africa and Asia and served for almost five years, earning a reputation as one of the most formidable and successful World War Two units.